Provide comfort for the family of Violet Jackett with a meaningful gesture of sympathy. Violet passed peacefully, surrounded by love at St. Lawrence Lodge on Monday, March 25, 2019 at the age of 93 years. Loving mother of Bill Jackett (Patricia), Debra (Larry Simpson), David Jackett (Sherry), and Connie Jackett. Dear grandmother of Patti (Dennis Poore), Jeff Jackett (Leigh), Shane Simpson (Jennifer), Deanna Jackett and Mariah Jackett. Fondly remembered by her numerous great-grandchildren. Predeceased by her parents John and Violet (nee Thivierge) Connelly, and by her siblings Nola Gormley, Robert Connelly, Doug Connelly and George Connelly. The family wish to thank the doctors, nurses and staff of the St. Lawrence Lodge for their compassion, care and support over the years. A private family service will take place at a later date. In honour of Violet, contributions may be made to the Canadian Cancer Society, the Arthritis Society or any charity of your choice. Arrangements have been entrusted to the Irvine Funeral Home, 4 James Street East, Brockville. 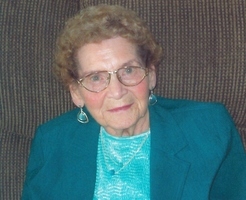 Provide comfort for the family of Violet Elizabeth Jackett (Connelly) by sending flowers. Dear Bill, Debbie, David and Connie and families please accept my sincere condolences on the passing of your Mom. I knew and worked with your Mother for many years. Always enjoyed our working days at Sweets. I remember we used to curse those red vests but they kept our blouses white. She was a hard working lady and a good Mother. I'm sure she enjoyed her grands and greats. She sure earned her angel wings. Thinking of you all at this sad time.